Monthly magazine for PHP Developers. When musketeers.me took over php[architect] in 2013, the monthly magazine was digital only. Geared toward tablets, the PDF design format was horizontally oriented, with 2-3 columns. 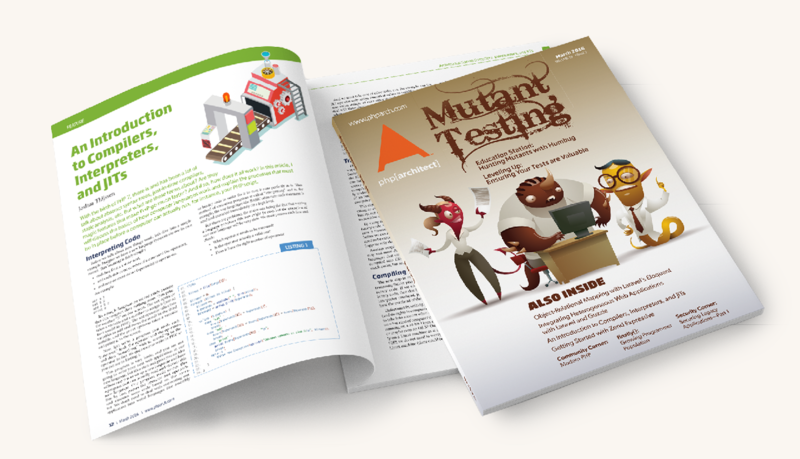 Being a magazine aimed at coding, about 1/4-1/3 of the content could be code examples. Horizontal limited you with how long these code snippets could be without breaking them across pages. After about three issues, we changed the format to a more traditional vertical magazine format—a format that it used to be when in print up to 2009. Print brought the ability to make spreads that spanned 2 pages—however, we had to keep in mind the PDF was still being read on tablets so I had to make spreads that works both as individual pages and single. For the Feature Articles, I had up to 5 colors to represent up to 5 features (muted versions of red, green, gold, blue, and purple). Each feature was introduced with a large wash of that color and an illustration. I was able to make interesting layouts that both embraced and broke the grid. Though, page count soon crept up and we were regularly going over our usual 64 pages—the printing price limit where we were paying more. The regular columns all had small headers of a muted navy blue and were started off with an illustration. After 3 years of one style, we revisited design, by observing what other mainstream magazines were doing. We decided to reduce the body font size from 11 point to 10 point, as well as changing the font from Gibson to Minion Pro. The new features still had the same coloring scheme, but drastically reduced mastheads and a single illustration. The new columns lost any illustrations and were started off with an image of the author.